Whether it’s fall, spring or even winter, it’s always a good time to have a wedding in the Carolinas. I’ve got some beauties coming up later this summer and fall and I wanted to give you a little preview of what’s been percolatin’ here at Jackie Fogartie Events! You really can’t go wrong with a beautiful backyard and outdoor lighting, and one of my upcoming weddings is proving it! With an intimate group of about 75 guests, this poolside wedding is what Pinterest dreams are made of. Here are a few inspirational pics for some of my upcoming weddings. 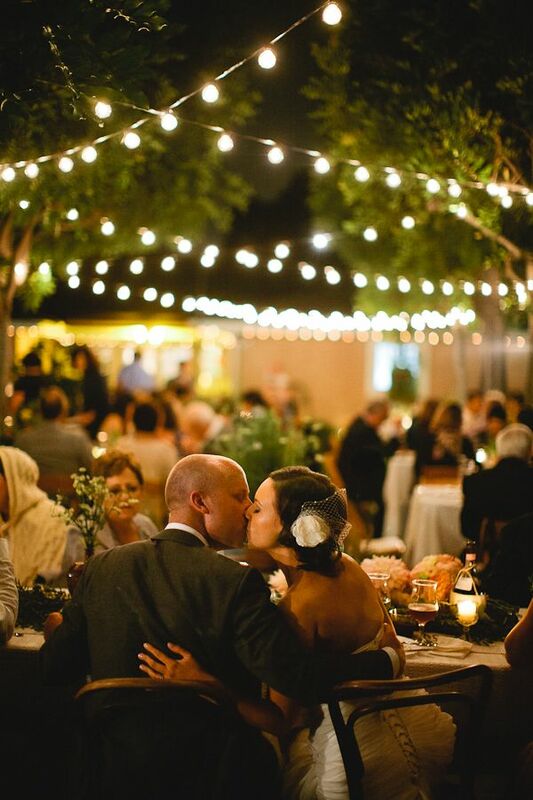 Stringing (professionally, of course) market lighting over the seating area creates a beautiful ambience. As does lanterns with candlelight lining the pool. And these rustic but elegant farm tables are going to make great family tables for this backyard beauty! My August bride is getting married at the Foundation for the Carolinas, a beautiful venue complete with floor to ceiling glass walls overlooking downtown Charlotte. I love the whole design but am especially excited about the desserts – and not only because I will get to sneak some, hehe. The cupcakes and other desserts will be perched on an acrylic display similar to the one below. With votive candles, dripping moss and beautiful confections, I’m beyond excited to see how this dessert display turns out! A color combo of black and white will never go out of style. Add in some white hydrangeas, sleek black tablecloths and shimmering silver mercury glass, and a beautiful wedding is just around the corner. My couple this fall is using all of these elements and I know it will be gorgeous! Anenomes are the perfect addition to a black and white wedding. A champagne toast is never a bad idea! Add a sophisticated element by dropping blackberries into the flutes for a black and white look! And this cake…well, it truly speaks for itself! Finally, I’m really loving the color combo of one of my fall brides. She’s bringing burgundy back with this burgundy, gray and navy color combo. After visiting a florist we decided we wanted to bring in succulents to complete the look. These wedding florals are our inspiration! Can’t wait to see the gorgeous florals later this year! I can’t wait for these beautiful weddings and more that I have coming up to finish out 2015! I’m planning well into 2016 too so there’s lots of planning and wedding fun in store. In non-wedding planning related news, I’m super excited to be part of a local campaign on behalf of the Marriott Charlotte Center City. I happen to love the Marriott Center City as it is located right in the heart of Uptown Charlotte. I suggest it to clients all the time for their wedding guests! The Marriott is renovating to make the hotel even MORE fantastic and because they are uber smart they are running a social media campaign called #DesignCharlotte. For the next few months you’re going to see me Instagramming, FB-ing, Tweeting and blogging about all the best Charlotte has to offer. Seeing that I love exploring new restaurants and of course love a good cocktail, you can look forward to seeing many pics of local brews and bites, all with the hashtag #DesignCharlotte. The best part is that you too can use the hashtag too and be entered to win some sweet giveaways. So for my Charlotte peeps, show off our city by hashtagging your little heart out (#designcharlotte), okay? I can’t wait to explore my city and of course see the Marriott in all its renovated glory. I mean how tiny is this little guy? And does he look half Italian? Maybe he’ll grow into it? !